This compact moss and weed sprayer is perfect for applying water based products including: Kingfisher "Biocidal Wash" and Kingfisher "K-Seal Patio Cleaner". Using a moss killer is one of the best weapons for enhancing your lawn. Regularly using a moss killer can often shield or even reduce the spreading of moss. Very easily controlled, it makes spraying your lawn with a moss killer easy and quick. This product can be comfortably mounted on your back, making it ideal for large lawns as well as small. There is no better method of cleaning a hard surface than spraying a professional moss killer. It can help you to remove stains and discolouring while reducing the growth of moss. Because it is a translucent tank, it is easy to fill. With its adjustable nozzle, the Kingfisher Moss & Weed Sprayer can reach almost everywhere in the garden. 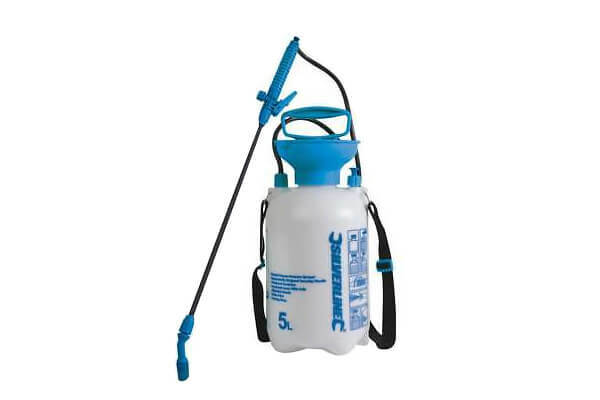 Used for both domestic and commercial purposes, this backpack sprayer has a shoulder strap, making killing weeds easy.